The Tailgater ZS turns any plastic tub into the perfect fly-fishing base camp. 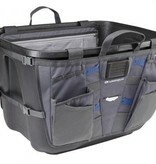 Now, Brian’s plastic tub also stores fly boxes, reels/spools, gloves, socks, jacket, etc. It also functions as a prep station for rigging up with flies, hemostats, leaders, tippet, floatant, etc… adjustable to fit almost any size and style of plastic tub/tote. 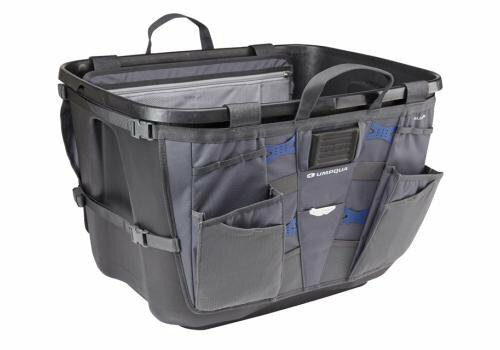 Two saddle-bag style organizers straddle the front and back walls of the tote and SR clip along the sides to secure. Each saddle-bag can also be used individually saddled over any rail or seat back. Four stretch-mesh pockets for tippet, floatant, etc. Daisy chain attachment loops for zingers, nippers, hemostats, etc.